Home education Maritime Academy of Nigeria, MAN admission application form for the 2015/2016 academic session is now on sale. Maritime Academy of Nigeria, MAN admission application form for the 2015/2016 academic session is now on sale. The Maritime Academy of Nigeria (MAN), Oron is inviting qualified and interested members of the public to her National Diploma (ND), Higher National Diploma (HND) and Post-Graduate Diploma (PGD) programmes and specialised seamen training courses for the 2015/2016 academic session. These are two-year (4 Semesters) courses of study leading to the award of the National Diploma in Nautical Science, Marine Engineering, Boat/Ship Building Technology, Electrical/Electronics Engineering Hydrography or Meteorology and Oceanography as applicable. h) Maritime Transport and Business Studies (2 Years). Holders of the National Diploma in Maritime Transport and Business Studies can take up a career as Supervisors in the operations administrative, commercial or finance departments of maritime establishments, shipping companies, shipping agencies, ports, oil companies, shore oil support companies, manufacturing companies, and organizations dealing with import and export of goods and marine insurance. They can also work in establishments dealing with maritime laW and marine environment protection. A] National Diploma [ND] in nautical science/marine engineering/ Boat & Ship Building Technology/Electrical Electronics Engineering/Hydrography/Marine Meteorology and Oceanography/Hydrologyand Coastal Resources Management. Applicants must posses the Senior School Certificate [SSC] or its equivalent with at least FIVE CREDIt pa**** in subjects which must include Mathematics, English Language, Physics, and any two of Geography, Technical Drawing, General Science, and Chemistry, obtained at NOT MORETHAN TWO SITTINGS. Applicants must possess at least FIVE CREDIT pa**** at NOT MORE THAN TWO SITTINGS of the Senior School Certificate Examination (SSCE) or its equivalent. The subjects must inIudeEnglish Language, Mathematics, Economics/Commerce and any two of the following: Geography, Government and Book-Keeping. Success in the competitive Entrance Examination which comes up on Saturday, January 25, 2014 at 0900 hours at the centres indicated below (See Section 4.1). Success in the Oral/Written Interview following the Entrance Examination. Passing the medical and physical fitness examinations and eye-sight test to be conducted by the Academy’s Medical Doctor. Applicants must be single and remain single throughout the duration of the programme at the Academy arid be between the ages of 16 and 21 years for 1A (a-b) and between 16 and 25 years for 1 (A) (c), (ci), (e), (f) (g) and (h) by the date of commencement of the session for which they are applying for admission. Applicants awaiting result of the SSCE or its equivalent need not apply. Note: Candidates are not required to bring recommendation letters from referees. Performance in the competitive Entrance Examination and subsequent written/oral interview. have undergone a minimum of one year Post-ND Apprenticeship Training or acquired Cognate Work Experience in a relevant establishment or organization. Applicants must possess a good Honours Degree (B.Sc.) or a Higher National Diploma (HND) in Business or Social Science from a recognised University or Polytechnic. Membership of relevant Professional body will be an added advantage. Candidates with qualifications equivalent to (a) above may be considered for admission based on maturity and length of service in the maritime industry. Applicants must possess a good Honours Degree or a Higher National Diploma (HND) in the Physical Sciences or Engineering from a recognised University or Polytechnic. Applicants must possess a good Honours Degree or a Higher National Diploma (HND) in Engineering from a recognised University or Polytechnic. It Class Marine Engineering Certificate (Foreign going). All candidates for the HND and PGD programmes must request the schools they attended to send the Transcripts of their Academic Records to the Academy under confidential cover. 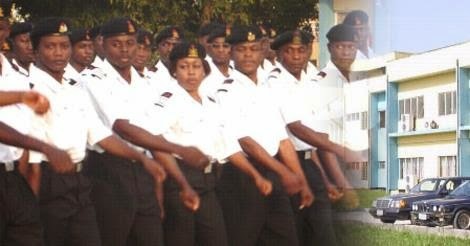 Maritime Academy of Nigeria Admission Processing. All prospective candidates seeking admission into the Academy should proceed to the unlisted Banks and obtained their forms for just Ten thousand Naira Only (N10,000). Upon successful payment, a receipt will be issued to you by the teller. Follow the “Registration Procedure” below to continue. o Log in with Payment Pin on your receipt (This is a 16 Character Alphanumeric pin i.e. 123456789012ABCD). The default password is “man2015” which can be changed after login. o After successful login, upload your passport; fill in the form correctly and save the form. NB: Do not click on the submit checkbox until you are ready to submit the form. o After filling the form successfully, you can submit the form by scrolling to the bottom of the page, check the submit checkbox and then click save. o You will receive an invitation for screening via Email and SMS. o The Screening date will also be made available on the website, so we recommend that you check our website: macademyoron.org frequently for updates.